The GWP cooperates with the Journal for General Philosophy of Science (JGPS): Members of the GWP receive free online access to the journal as well as the possibility to subscribe to the print edition of the JGPS for the special price of 50 EUR a year. Publications which result from the triannual GWP conferences are also published in the JGPS. 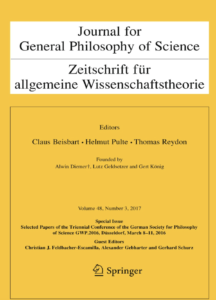 Die GWP kooperiert mit dem Journal for General Philosophy of Science (JGPS): Mitglieder der GWP erhalten freien Online-Zugang zum Journal sowie die Möglichkeit, die Print-Ausgabe des JGPS zum Vorzugspreis von 50 EUR pro Jahr zu erwerben. Publikation, die aus den im dreijährigen Rhythmus stattfindenden GWP-Konferenzen hervorgehen, werden im JGPS veröffentlicht. The Journal for General Philosophy of Science is a forum for discussion concerning the philosophy of science. Its subject matter encompasses the philosophical, especially methodological, ontological, epistemological, anthropological, and ethical foundations of the individual sciences. The coverage brings the natural, cultural, and technical sciences into a philosophical context, including discussion of historical presuppositions and conditions of the current problems of the philosophy of science. The journal bridges gaps between the different sciences, especially the natural, cultural, and social sciences. Its discussion exposes the common as well as the divergent methodological and philosophical foundations of the individual sciences, and takes into account all currently relevant positions of the philosophy of science. The journal considers the historical dimension of the sciences as context for understanding current problems of philosophy of science.